Democrats could be watching history made in Denver. If he&apos;s nominated tonight as expected, Barack Obama will become the first ever African-American presidential candidate for a major party. U.S. Senator Russ Feingold (D-WI) says it will be a moment to remember. However, Feingold told Wisconsin delegates Wednesday that the work doesn&apos;t end tonight, it ends on November 4th. He says Democrats need to return home and work to elect Obama. Feingold pledged to stand by their side in the effort. Feingold says Democrats need to highlight Obama&apos;s ability to get the job done, his sound judgement in Washington, and his leadership. The Wisconsin Democrat also praised Obama for picking Senator Joe Biden as his running mate. 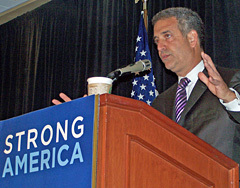 Feingold says Obama has everything he needs to become the next U.S. President.